Put tofu, chili powder, oregano, cumin, coriander and salt into a bowl and mash together with a fork. Set aside. Heat oil in a large skillet over medium heat. Add garlic and about two-thirds of the green onions and cook until fragrant, about 2 minutes. Add tofu mixture and cook, stirring occasionally, until most of the moisture has evaporated, 10 to 12 minutes. Add beans and remaining green onions, stir well and cook until beans are heated through, about 2 minutes more. Spoon tofu mixture into tortillas, top with lettuce, tomatoes and cheese and serve. 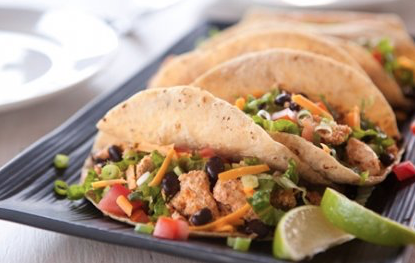 Per Serving: Serving size: 2 tacos, 350 calories (160 from fat), 18g total fat, 7g saturated fat, 30mg cholesterol, 760mg sodium, 36g carbohydrates, (8 g dietary fiber, 3g sugar), 20g protein.